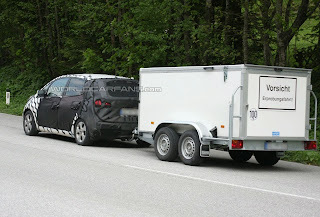 Kia's latest creation, No3 has been spied undergoing towing testing in Austria. So why No3? 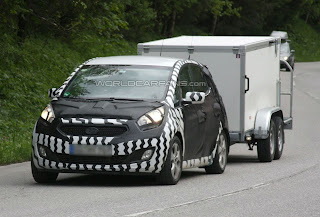 Because the vehicle will be the third car in the manufactures car line-up, a little like sister company, Hyundai. The large water filled plastic containers and suitcases are suppose to simulate adult passengers. A concept was unveiled in Geneva back in March at the Geneva motorshow, so spied prototypes bare very close resemblance to the concept. The new MPV will be based upon the Kia Soul platform - which is shared with the current Rio and Hyundai i20 but will also underpin the next Rio supermini. The "YN" is likely to use Kia's 1.6 litre petrol and diesel engines and a 1.2 litre petrol engine, taken of the Hyundai i20 and even a 2.0 litre petrol. To cut CO2 emissions, stop&start will be offered after its launch. Expect right-hand drive sales in February 2010, after an Autumn 2009 debut. Prices are estimated to start at around £11,000 - £13,500, on par with rival's such as the Citroen C3 Picasso, Nissan Note, Vauxhall/Opel Meriva, Renault Modus, FIAT Qubo and Skoda Roomster. 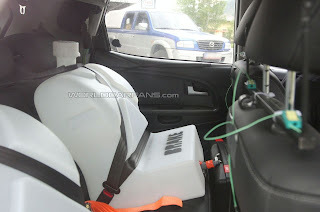 For your money, front fog lights, body-coloured electrically adjustable & heated door mirrors, sliding rear seats, leather steering wheel with audio controls, tilt adjustable steering wheel, drivers seat height adjustment, air conditioning, alloy wheels and a panoramic glass sunroof will be some of the features as standard.